• Two girls with hypokalemic and hypochloremic metabolic alkalosis and failure to thrive were found to have Bartter syndrome at ages 9 and 6 months. Both had normal blood pressures despite substantial elevation of plasma renin activity and evidence of secondary hyperaldosteronism. A similarity in facial features, including prominent forehead, a large head, triangular facies with drooping mouth, and large eyes and pinnae, was noted in these two infants and in published pictures of other infants with the syndrome. 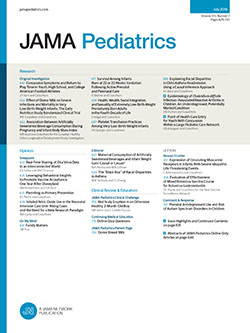 Although the normotension associated with substantial elevation of plasma renin activity and hyperaldosteronism in Bartter syndrome has been considered the effect of hypovolemia, a normal or slightly elevated plasma volume was found in these infants, suggesting that in certain cases an alternate mechanism for the depressed response to renin may be present.